Hearing Testing - What Can I Expect? Hearing Testing – What Can I Expect? The hearing test truly is the easy part. The challenging part is accepting your hearing loss and actually booking the hearing test in the first place. You’ve probably heard the stats by now: 48 million people in the US suffer from hearing loss but only a small fraction actually do anything about it, and only 20 percent of people who could benefit from hearing aids actually utilize them. So if you’ve already scheduled your hearing test, well done, you’ve already conquered the biggest impediment to healthier hearing. The hearing test, as you’ll discover, is an easy, non-invasive process that will confirm the severity of your hearing loss to help develop the most suitable treatment course. Shortly after you first arrive at the office, you’ll start by completing some paperwork. Then, you’ll meet with your hearing care professional to go over your hearing health history. Your hearing loss, if existing, can be a result of exposure to loud sound, the natural aging process, or by an underlying condition. 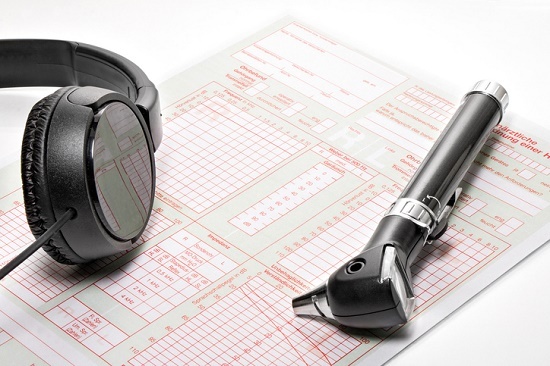 You’ll want to exclude any underlying conditions before moving on to the actual hearing exam. If you have an earwax impaction, as an example, you may very well be hearing better within minutes shortly after a professional cleaning. The existence of any other ailments will be assessed and the applicable referral made, if necessary. After going over your basic medical history, you’ll go over your subjection to loud sounds, your hearing loss symptoms, and exactly what you wish to achieve with better hearing. It’s crucial to determine possible causes, how symptoms are negatively affecting your life, and how better hearing will enhance your life, which is after all the whole point. Be suspicious of the practitioner that doesn’t seem to really care about the main reasons why you desire to improve your hearing in the first place. There’s one more step to take before starting the hearing test: the visual examination of the ear with a device called an otoscope. This will help in ruling out any problems with the ear canal, the eardrum, or the abnormal accumulation of earwax. Next, you’ll be accompanied to a sound-treated room with your hearing care provider. You’ll be required to put on headphones, and the provider will start to play you some sounds. You will be presented with various sounds at different frequencies, and you’ll be asked to identify the quietest sounds you can hear at each pitch. This is termed your hearing threshold, and the hearing care provider will capture these values on a graph known as an audiogram. The hearing test may also incorporate speech testing, where you’ll be asked to repeat the words delivered to you. Various types of words, delivered at different volumes with and without background noise, will be introduced. This will help establish if hearing aids can help you with speech understanding. When the hearing test is completed, your hearing care provider will discuss the final results with you. Referencing your audiogram, your hearing care professional will now review your hearing in both ears. Based upon the results, your hearing will be categorized as normal or as exhibiting mild, moderate, severe, or profound hearing loss. If a hearing loss is found, the next step is discussing your treatment options. Seeing as there are no present medical or surgical treatments to repair hearing damage, this means examining your hearing aid options. They can help you identify the ideal hearing aid model to meet all of your objectives. They can help you identify the advanced functions you need—along with the ones you don’t—at a price tag that complements your budget. They can program your new hearing aids to amplify only the sounds you have difficulty hearing—ascertained by the hearing test—ensuring optimal sound quality. And that’s it, a quick, easy procedure in exchange for a lifetime of healthier hearing. We’d say that’s a very good deal.